I was definitely intrigued and decided to stick around for a week. At least I could tell my friends that I visited a yeshiva in the Old City of Jerusalem. What a fascinating idea to give up your life for a cause and enjoy it also. Rav Noach had a beautiful way of putting things; he got to the essence. After becoming observant and learning in Israel for a number of years, I went in to speak to Rav Noach to discuss what I should do with my life. He tried to teach all of us that the world is our responsibility. It was tough to be around Rav Noach because he never stopped, he just kept going. The job had to get done. You have to fight to win. What does the Almighty want from you? So many people told me that when they saw Rav Noach coming they would get scared because they were reminded of what they really should be doing and that they should not settle for being second rate, for mediocrity. Rav Noach was a fighter. He just couldn’t stand on the side lines. When change was needed, whatever it was, he was there making an effort. Of course Rav Noach would say “my parents.” And then sometimes depending on who would give him more spending money that week, he would say either is mother or father first. He made all of us laugh. He had a real joy and zest for living. He always was a fighter trying to make things better, to change the world. Rav Noach really was on a mission to save the world. “What do you mean we can’t bring back the Jewish people? Fix the State of Israel? Fight radical Islam?” The list goes on and on and on…. Twelve days ago, for example, I sat with the Rosh Yeshiva in his apartment. He was suffering. I showed him Rabbi Yaakov Salomon’s video blog on Aish.com on the bishop who denied the Holocaust and was reinstated into the church. The Rosh Yeshiva said, “This is outrageous. We have to get 25,000 people to see this and to protest. 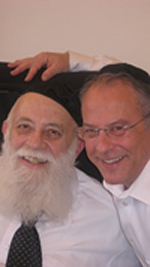 We can’t sit by.” And we would always say, “Rav Noach be realistic,” and that would just get him going more because he saw the end in mind, he knew what could be done if we only had the drive. And the Rosh Yeshiva would be so frustrated because he knew with deep belief and commitment that God runs the world, we have the Torah, we are the Jewish people; we have changed the world and we still can change the world. Not only was he a visionary who wanted to change the world, he was a man who had a tremendous love for the Jewish People and for individuals. He instilled in all of us a sense of “we must do, we must make the effort”, we can’t sit by, the world is our responsibility, don’t rely on anyone else to take care of it. Not only was he a visionary who wanted to change the world, he was a man who had a tremendous love for the Jewish People and for individuals. We always felt his tremendous deep and personal love and caring for us. His smile, the gleam in his eye, he was able to pick us up when we were down and encourage us when we were discouraged. He was always pushing us to achieve greater and greater heights of success, spiritually and materially. He would give us advice on our relationships, marriage, being upset with someone or something, how to grow, what to learn, how to learn it, and it goes on and on and on. He taught us all that the Almighty wants us to have the ultimate pleasure, He is our Father in heaven and our job is to take pleasure in this world and our relationship with Hashem, whether it is in doing the right thing or in having a good meal, whatever it was. We need to work on it; we can’t just go through life half asleep. We need to live to the fullest from the minute we wake up to the minute we go asleep and sleep was only an interruption to living, not an escape from life. His Torah was deep and practical and he always said the whole point of Torah is to teach us how to live. If you are learning Torah and you are not asking “what do I do about it?”, then you are not learning the right way. Rav Noach believed in the power of the Jewish people. We brought universal education, monotheism, dignity for the individual. If we’d get serious, organize, and ask what do we need to do — What are the solutions? What have we tried? etc. — imagine what can be accomplished! If we only took on this responsibility we could really make a huge difference. He believed in us, he saw the power of the Jewish people and had the faith in Hashem to know that the Almighty could save us. I am sure that the Rosh Yeshiva is now with the greatest of greats. May we all merit to follow in the Rosh Yeshiva’s footsteps, to come together and unite with what we know has to be done May all our efforts, our mitzvahs and the hundreds of thousands — even millions of people who have been changed because of Rav Noach — may it all be an elevation for his soul.